Are we still doing small parks? Is there a way to download openrct2 on chrome os? many attractions in the park, RCT is closing. 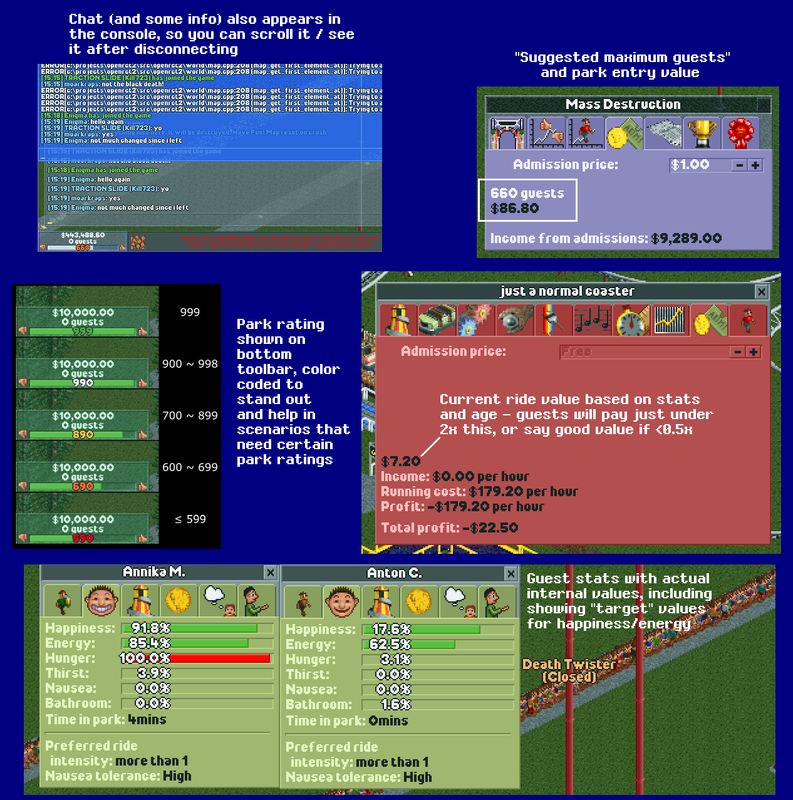 Where to obtain a copy of RCT1 online? v0.2.2 release, anyone else getting corrupted queues? I'd like to get into RTC! 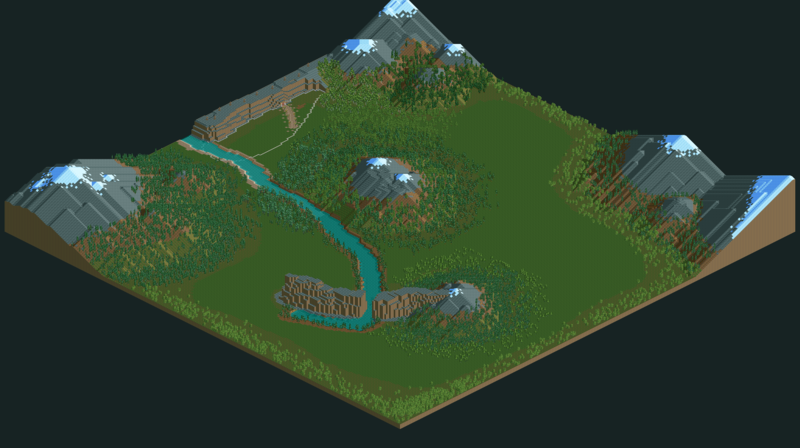 Looking through other people's projects today but I couldn't join the Bannerhero server on OpenRCT2, so hopefully I can find them here? :) I just wanted to say it's awesome to see another K-On! fan in the community!!! How to "lock scenery" a la Rainbow Valley but in any scenario for all scenery types? Alternatively, how to disable the auto-scenery-removal thing when building? 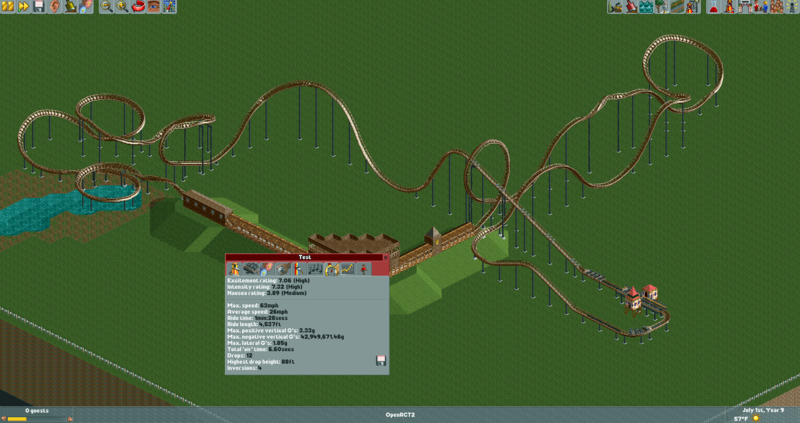 First Time on OpenRCT2 - Rotation Glitch? Relocate a chunk of scenery after placement? 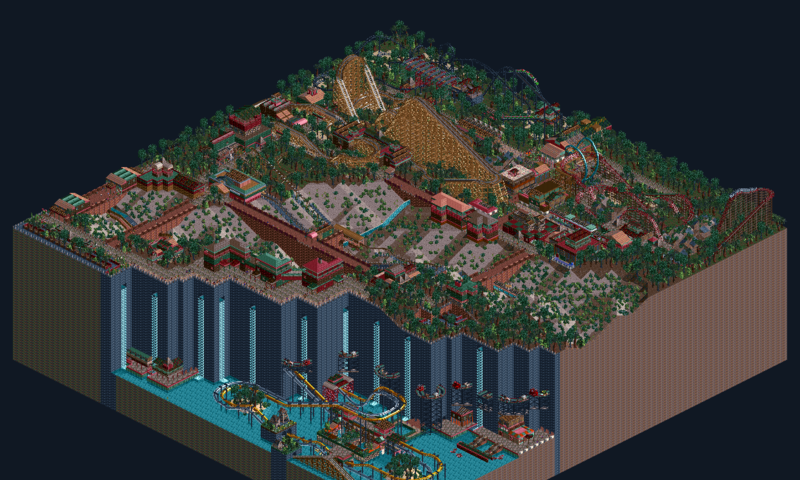 Open RCT2: Manic Mines! More screenshots in comments. Can't find certain ride types? Am I missing something or does the handyman under the flowers trick no longer work? Does the scenario editor limit how many objects you can use in Open? Would you watch average people slowly learn the game that is OpenRCT2? 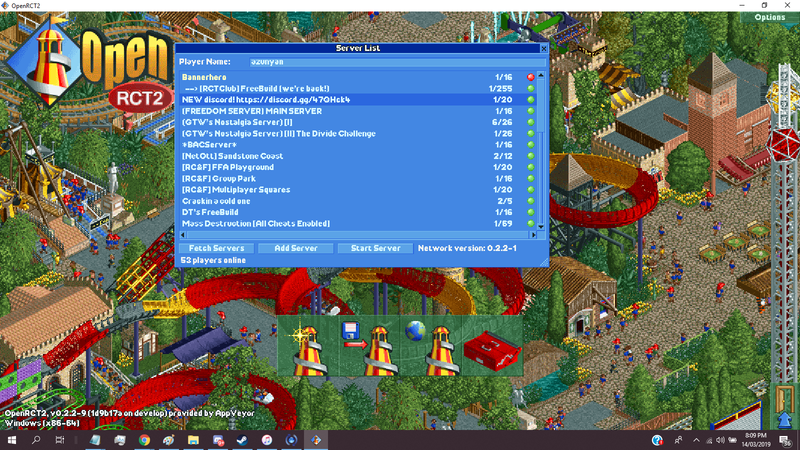 OpenRCT2 Update: Auto download missing objects! Game window won't stop closing when I click away, and the camera keeps panning when I move my pointer to another monitor. How do I install Open RCT for android? made a coaster that drowns people for 1 minute...they are underwater but they dont start drowning?? How to find sandbox mode. Are the guests generally smarter in openrct2 than in unmodded rct1? Are they still working on the lighting effects? Is there any way to make cheats save upon exit? Can't open Launcher. Ubuntu 18.04. Does the multiplayer allow you to do the scenarios together? My first scenario! Was pretty excited about it.. then I looked at some other scenarios people have posted here which is way more awesome... But hey, you gotta start somewhere! Help! Need an ELI5, I already read the FAQ but still can't wrap my head around how to get it up and running. It's for a kid. Trying to build for windows and getting an error: "fatal error C1083: Cannot open include file: 'algorithm': No such file or directory"
I just found out about the Ctrl-Shift Virtual Floor tool. What other keys/tools/tricks everyone should know about? Encountering the "undefinied string" error with certain stalls. 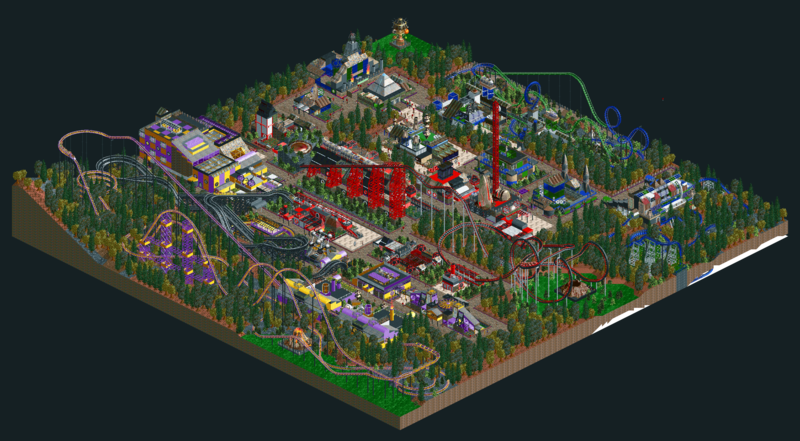 10 Reasons why you should get OpenRCT2! How many people are able to be in one local multiplayer server at a time? How the hell do I make money in this game? Is bootcamp still required for me to play openrct2 on Mac? I have completed scenario but it's not showing up as completed. Crash on bank/roll for multiple coasters. For the more technical users. Why do my finished scenarios not display as finished? Will it work with the Triple Thrill Pack? 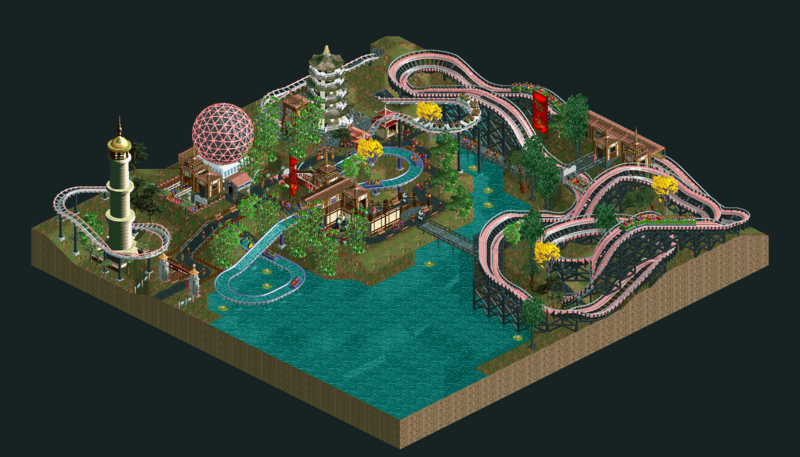 How can I make a free play game in openrct2? 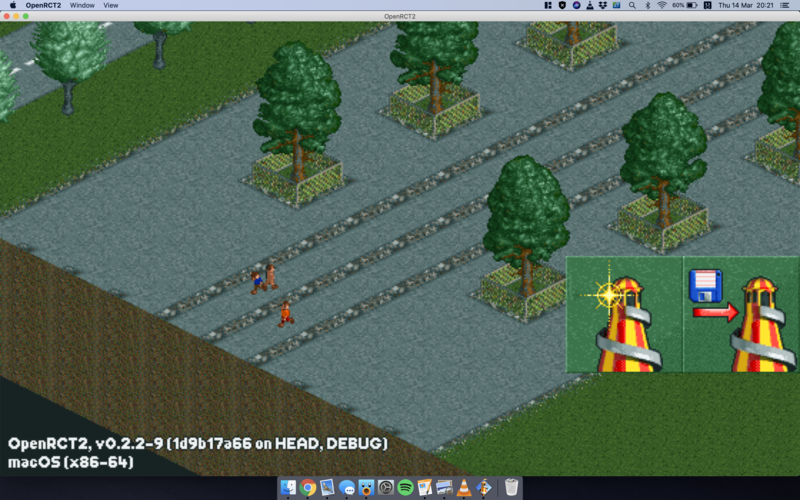 Are double paths acceptable in OpenRCT? A new feature for sorting by cost. RCT1 Scenarios best experienced in...? Would this game be suitable as an educational, multiplayer platform?